“Reducing your carbon footprint just got easier. This video uses animations and humour to teach people how they can personally help prevent global warming. The City of Toronto has set a goal to reduce greenhouse gas emissions by 80% by the year 2050 to help reduce the most negative impact of climate change. “TransformTO is a project that will engage Toronto residents and businesses in imagining the transformative changes we will need to reduce our greenhouse gas emissions by 80%, while at the same time improving public health, enhancing our local economy, and reducing social inequalities…. Reducing our emissions to address climate change will involve a community-wide effort. TransformTO will be co-created with ideas, advice and input from residents, businesses, community organizations, and research institutions, and analysis will help us identify what is technically feasible as we look to create the best path to a low carbon future. A short-term strategy (2017-2020) outlining the actions that will allow Toronto to meet its 30% greenhouse gas emissions target by 2020 through policy and programming. A long-term (2020-2050) approach that will identify how we can reduce emissions by 80% by 2050 while generating a healthier, more prosperous and equitable city. Events will begin with an open house from 6 p.m. to 7 p.m., followed by a presentation and conversations from 7 p.m. to 9 p.m. Seating is limited. Please register online. 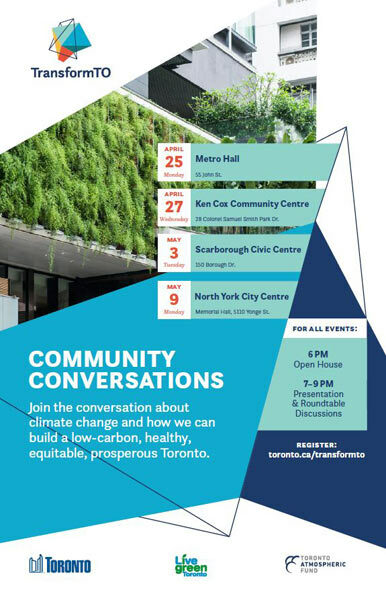 Residents can learn more about TransformTO and register to attend at: toronto.ca/transformto. Environment and Climate Change Canada is looking for your input on the draft 2016-2019 Federal Sustainable Development Strategy. In order to mitigate the effects of climate change, reduce GHG (Greenhouse Gas) emissions levels and build resilience to climate change. The new strategy outlines how 37 federal government departments and agencies are working to create a sustainable economy and protect the environment for the next three years. The strategy also outlines the Government of Canada’s environmental sustainability contributions to the 2030 Agenda, a set of global sustainable development goals. Planning for a Sustainable Future. 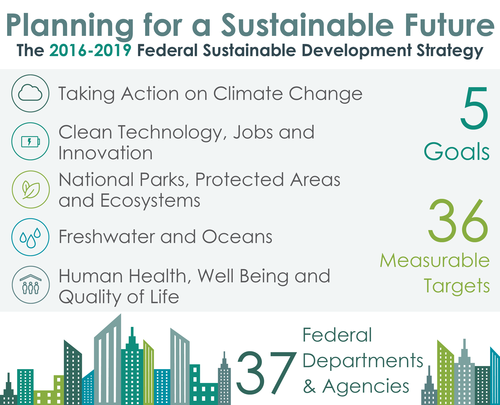 The draft 2016-2019 Federal Sustainable Development Strategy includes 5 goals, 36 measurable targets, and 37 federal departments and agencies. The 5 goals are: Taking action on climate change; Clean technology, jobs and innovation; National parks, protected areas and ecosystems; Freshwater and oceans; Human health, well being and quality of life. The Federal Sustainable Development Strategy (FSDS) is the government’s plan and vision for a more sustainable Canada. A draft 2016–2019 strategy was recently released for consultation. Tell Environment and Climate Change Canada what you think of the draft 2016–2019 strategy, at http://www.fsds-sfdd.ca/#/en . Please share the above link to the draft strategy with others, so they can comment too. You can also visit the Let’s Talk Sustainability discussion space to join in on the conversation about sustainability. “Public input is essential in building a solid strategy. We want to hear from a wide range of Canadians and get your views on what a sustainable Canada looks like. We also want to hear your ideas about what sustainability targets government should aim for over the next three years—and how those targets can best be measured and reported. This is an update to the following blog, Ontario’s Rules to Reduce Neonicotinoid Pesticide: Protect Bees: Submit Comments Until May 7, 2015. This proposal has been posted for a 45 day public review and comment period starting January 22, 2016. If you have any questions, or would like to submit your comments, please do so by March 07, 2016 to the individual listed under “Contact” at http://www.ebr.gov.on.ca/ERS-WEB-External/displaynoticecontent.do?noticeId=MTI3MzAw&statusId=MTkyMjQ5&language=en. Additionally, you may submit your comments on-line. All comments received prior to March 07, 2016 will be considered as part of the decision-making process by the Ministry if they are submitted in writing or electronically using the reference EBR Registry number 012-6393 and form provided in this notice at http://www.ebr.gov.on.ca/ERS-WEB-External/displaynoticecontent.do?noticeId=MTI3MzAw&statusId=MTkyMjQ5&language=en . 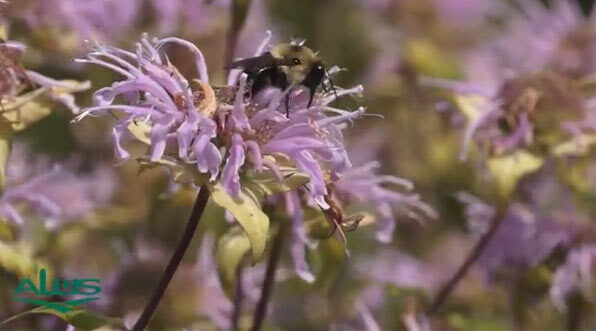 Complete an online survey at https://www.ontario.ca/form/pollinator-health-action-plan-survey . “Ontario is a world leader in fighting climate change. Alongside our global partners, we’re making a difference. Ontario is building transit friendly cities to cut down on vehicle emissions and helping businesses reduce their carbon footprint. And perhaps most importantly, we’ve ended coal-fired electricity generation in the province. Together we can change climate change. December 7, 2015 1:00 P.M.
Help keep this holiday season merry and bright by making environmentally friendly choices to help fight climate change and keep Ontario’s air, land, and water clean. Choose energy-efficient holiday lights and put them on timers to save on electricity bills. Reduce waste by sending holiday greeting cards electronically, or pick cards printed on recycled paper. Choose a real, Ontario-grown Christmas tree from a local tree farm or retailer. Make your holiday travel as green and safe as possible. Carpool or take public transit to holiday parties. If you have to fly over the holidays, consider purchasing carbon offsets. Make your festive dinners environmentally friendly while supporting local businesses. Choose from Ontario’s wide range of local foods available in December. Shop local or buy gifts made from Ontario wood or recycled non-toxic plastic. Keep batteries out of landfills by giving gifts that don’t need batteries. If you need batteries, make them rechargeable. Get creative with your wrapping. Reuse paper from household items like calendars, newspapers and fabric or decorate brown craft paper that can go in the Blue Box. Reuse your wrapping paper for other holiday decorating. Buy gifts with less packaging, and recycle when you can. Bring your own reusable shopping bags to stores. The Rio Earth Summit in 1992 (the ‘Rio Convention’) included the adoption of UN Framework on Climate Change (UNFCCC). The UNFCCC now has a near-universal membership of 195 parties. The main objective of the annual Conference of Parties (COP) is to review the Convention’s implementation. 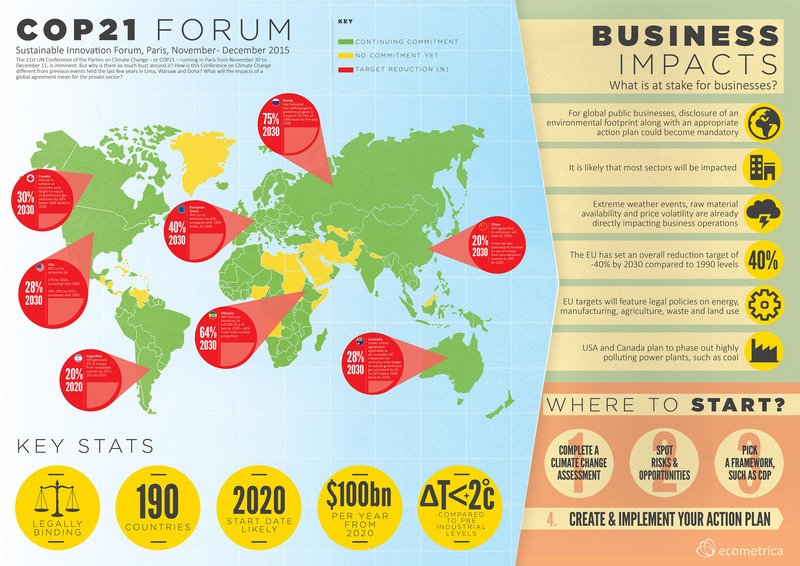 This “is an infographic on some of the key commitments that have already been put forward by countries and territories in advance of COP21, along with a breakdown of the main business impacts, and what companies can do to prepare for the outcomes of the conference.” Infographic by ecometrica.com at http://ecometrica.com/article/what-does-cop21-mean-for-business . Please click on the image for a larger version. For more detailed information on COP21, what it’s all about and what it means for private sector companies, you can download ecometrica.com’s FREE paper at http://ecometrica.com/article/what-does-cop21-mean-for-business, entitled Paris Climate Conference: What’s at stake for businesses at the COP21? 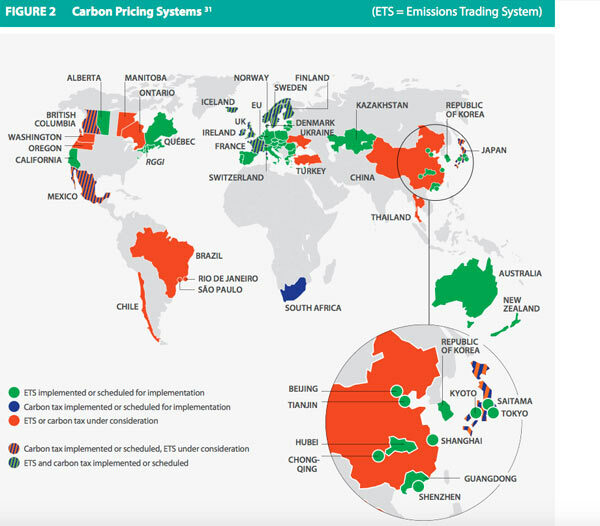 Authored by Sandy Gain, Climate Change Analyst at Ecometrica, the paper goes into further detail about what’s at stake for businesses, gives some great examples of existing corporate projects, and explains how a new CDP framework can help businesses move towards a low-carbon economy. 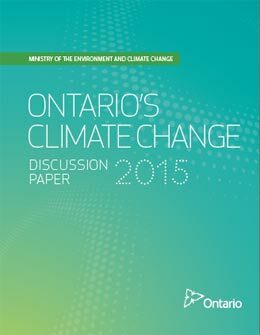 This is an update to the previous blog, Climate Change Strategy Discussion Paper for Ontario, Canada: Consultations in Feb. & March + Submit Your Comments by March 29, 2015. This video presents Al Gore speech on climate change & environment in Toronto, Ontario. Al Gore speech at the Mars Discovery District in Toronto, Ontario. Due to the problem of Climate Change, the City of Toronto has established a goal of greenhouse gas emission reductions of 80% by 2050. 80 percent by 2050 (17,600,000 tonnes per year. To help meet that goal, the City of Toronto’s Parks and Environment Committee has established a Subcommittee on Climate Change Mitigation and Adaptation. The first meeting will set a Terms of Reference for the Committee. You can help them by either submitting written comments or delivering a deputation in person at the meeting. For more details on how to participate, please contact Carol Kaustinen at pec@toronto.ca, 416-338-5089 or visit the City’s Clerk’s website. The Subcommittee will make recommendations to the Parks & Environment Committee based on research and community engagement. By the end of the Subcommittee’s term – December 31, 2016 – what do you feel the Subcommittee should have accomplished and/or created? How would you or your group like to be involved and engaged in the Subcommittee’s work? 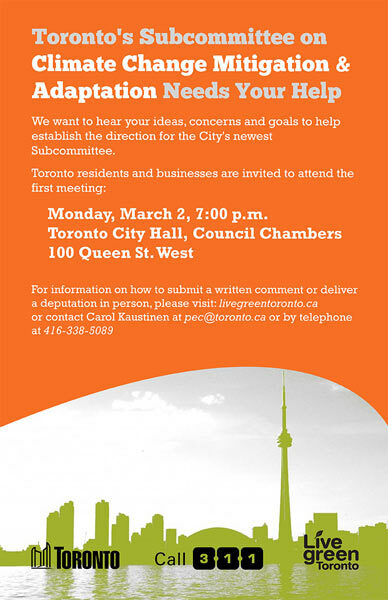 Please click here for more info about Toronto’s action on climate change and the city’s related reports. Residents are invited to attend the first meeting of the City of Toronto Parks and Environment Committee’s Subcommittee on Climate Change Mitigation and Adaptation on March 2. Recognizing the importance of climate change, the City established the goal of reducing greenhouse gas emissions by 80 per cent by 2050. This video presents Climate Change 2014: Mitigation of Climate Change. “Climate change is the critical issue of our time. Two numbers that are vital for Ontarians to be aware of: 4, the number of degrees in this century that the planet is on track to warm by, and 6, the number, in trillions of dollars of new economic growth that will result from moving to a low-carbon economy. A 4 degree increase in the mean temperature of our planet will have catastrophic consequences. Severe weather events are already driving up insurance costs and severely damaging our infrastructure. Food security and costs will be an early problem as climate change impacts where our food is grown and affects our water supply. Climate change is a problem with a solution. Reducing our carbon emissions will produce a new innovation economy in Ontario. Building on our early leadership in sustainable technology and innovation, Ontario is well positioned to seize the opportunities of a low-carbon economy if we are prepared to take bold action. Reducing our energy costs through the establishment of new building standards, and the use of new technologies, will enable us to reduce the emissions from our homes. Moving to low-carbon and zero emission transportation options will allow us to move to and from our homes and jobs more efficiently, while improving the air we breathe and growing our manufacturing sector. The new low-carbon economy will mean more and better jobs. It will avoid an environmental crisis and secure our future as a global green service and industrial economy leader. Figure 1 shows that in the absence of new actions, we expect Greenhouse Gas (GHG) emissions to begin to rise again as our economy and population grow. The illustrative wedges emphasise the importance of taking action early as delays take us further from our targets. The discussion paper’s purposes are as follows. It identifies the climate change challenge, the risks and threats it poses to Ontario’s environment, economy and way of life. This discussion paper suggests actions that encourage individuals, businesses, government and communities to do more to reduce greenhouse gas emissions (GHG). 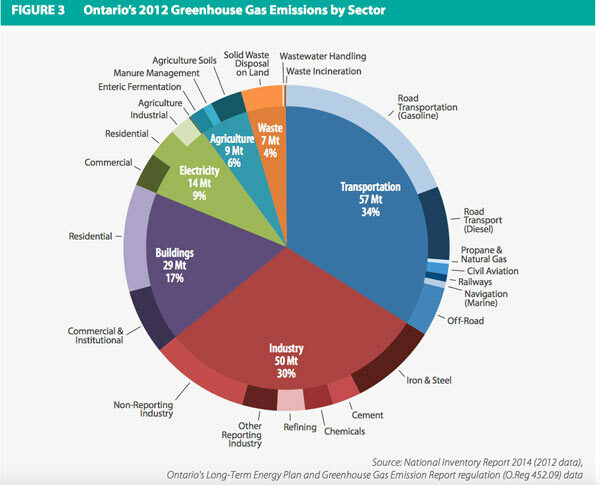 Figure 3 shows the sectors responsible for greenhouse gas emissions in Ontario. 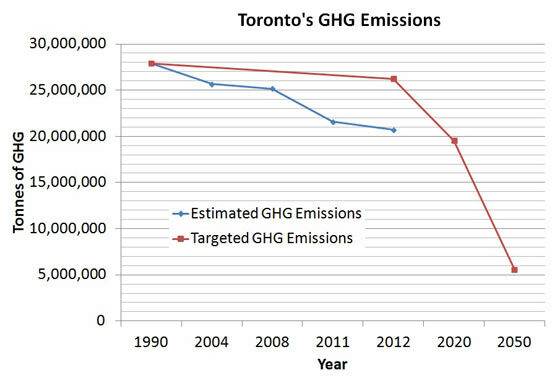 Ontario’s 2012 GHG emissions are estimated to be 167 Mt. The transportation sector had the largest share of emissions, followed by the industrial and buildings sectors. It also focuses the mind on how to change current behaviours. It is important to note that this pie chart only captures emissions and does not reflect the important role and value of carbon sinks in removing carbon from the atmosphere, for example in the forestry and agricultural sectors. 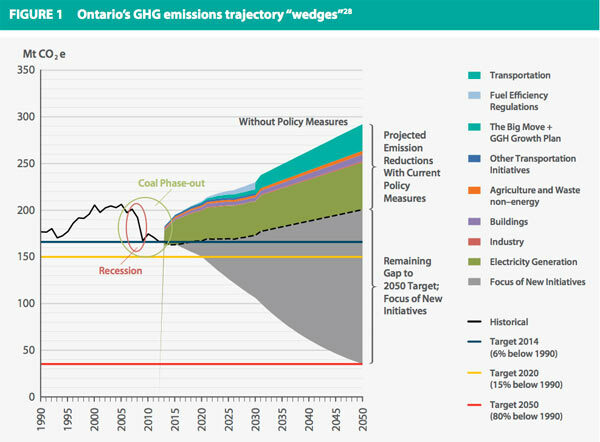 determine which initiatives and programs currently underway are the most effective in reducing emissions and building resilience in order for Ontario to meet its emissions targets and adaptation goals. This discussion paper invites comments through a series of questions at the end of the paper. This document will be posted to the Environmental Bill of Rights for a 45 day comment period. This proposal has been posted for a 45 day public review and comment period starting February 12, 2015. All comments received prior to March 29, 2015 will be considered as part of the decision-making process by the Ministry of the Environment if they are submitted in writing or electronically using the form provided in the notice at http://www.ebr.gov.on.ca/ERS-WEB-External/searchComment.do?actionType=add&noticeId=MTI0Mzcz&statusId=MTg3MjY0&noticeHeaderIdString=MTI0Mzcz and reference EBR Registry number 012-3452. During and after that time, focused discussions, town halls meetings and stakeholder forums will be organized to ensure that the themes and approach are considered from a number of stakeholder perspectives.